That color just POPS off the screen! I would totally go for a piece or three of that cake. I think you’re a genius for thinking of the Kool Aid to solve the problem. I do love anything strawberry! YUM! Oh I do too… It just always tastes like spring! 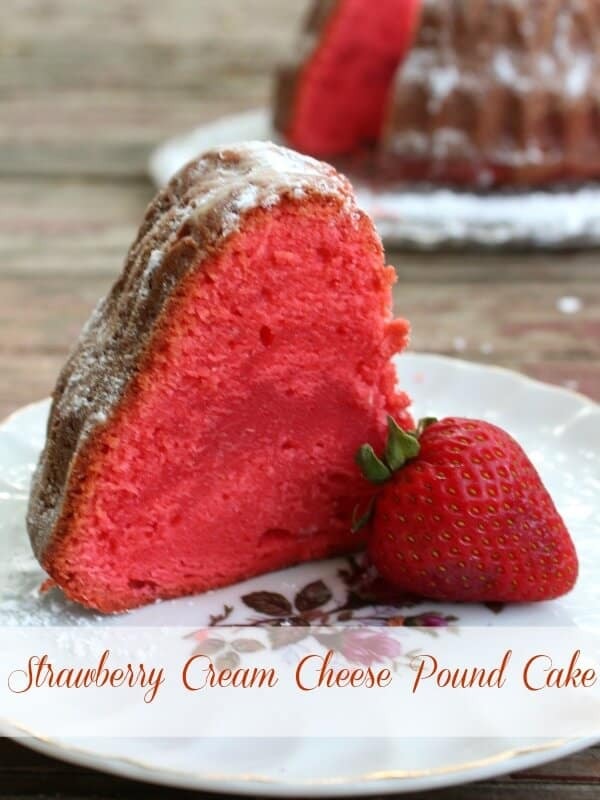 What a great idea to twist strawberry and creme cheese for your poundcake..would like to try it. I have made this twice ad it was a hit both times. Easy and good! I’m glad! Thanks for telling me! I want to use this recipe for a wedding cake but I need to know ahead of time how many cups of batter this recipe makes. Can you help me out? Kayla I’ve never measured it exactly but I did just measure my bundt pan that I used to make this and it holds 10 cups so I’d guess that you could plan on at least 10 cups of batter per recipe. Hope this helps. 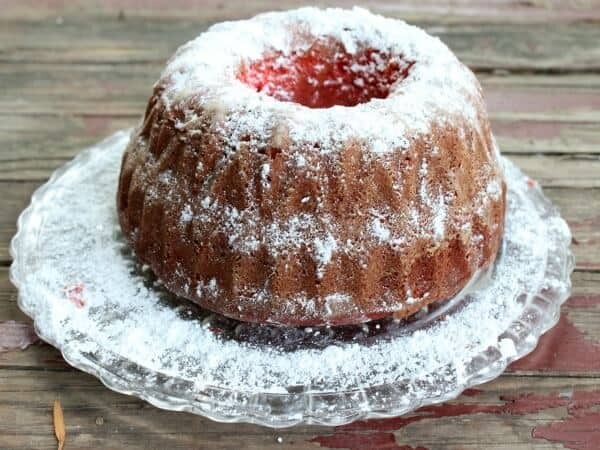 I’ve never made a Pound Cake, but this recipe looks yummy! I’d like to make Petit Fours for Valaentine’s Day using this recipe but I would rather bake in a loaf pan. How long would you suggest I cook in a loaf pan? Since there are all kinds of sizes of loaf pans, could you also suggest the size I’d need to use? I’d think I’d have too much waste in using a Bunt Pan. Thank you! This sounds absolutely fabulous. I was wondering though if I could make this into a cake version rather then bundt? And if so. What frosting would you suggest ? Thanks ! I have to make a bday cake this weekend and thought how lovely it would be to cut into it and see is beautiful red ! Somehow your comment got misplaced. I am so sorry! I hope your birthday cake was awesome! I’d use cream cheese or vanilla frosting. MY WIFE AND I ARE MAKING THIS FOR THANKSGIVING! Love your secret ingredient. Love the vibrancy of it. I think it would make cake to serve at my daughter’s tea party. The color is so vibrant!! Beautiful cake! Did you ever tell the unsuspecting guest your secret ingredient? I’m dying to know her reaction! I have yet to use Kool Aid or Jell-O in my cakes, but I know what you mean about them standing up to the wedding cake “standards.” It looks so good and I love the colour! Kacey – I didn’t like the jello because I thought it gave the cake a weird texture. 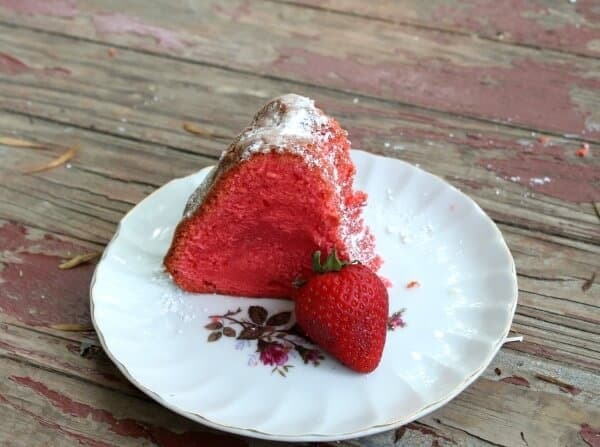 I love pound cake and that red color is just fantastic! Add kook-aid was a genius idea! What a gorgeous color! I would love a big slice. This looks awesome! I have made cupcakes with koolaid before and it totally works! I always get requests for strawberry cakes and pound cakes. The color is intense, but this will be a holiday cake. Could I use only 1 pack of kool-aid. I received your recipe via text message from one of my close friends who wants me to make her your recipe for the tangy strawberry cream cheese cake. In the past I have been very successful with making pound cakes such as lemon and the original. I want to ask if it is necessary to add in 1/8 salt? The reason being is that I noticed that the recipe calls for 1 cup of salted butter. I just want to make sure that the cake wouldn’t taste salted since this cake will be sold to her. is it possible to use unsalted butter and add in the salt? or just use the salted butter and omit the salt? The recipe should say UNsalted butter..fixing it now.thanks. I made this cake last night and while the taste is awesome, it didn]t rise at all. No baking powder or soda in recipe. I used AP flour. Thoughts? You should Catherine! It’s very cool…. or kool. Whatever. What a fun cake! And using Kool-Aid is brilliant. Would be great for a kid’s birthday party. Susan, I think so. This has opened up a whole new world of flavor possibilities for me! Thanks Chrisy! It is pretty bold. The color is gorgeous! This looks so delicious! I want it with the coffee I am having right now! 🙂 it really is! Thanks! I’ve been asked to make a wedding cake a couple times too, but turned it down! It’s a bit scary and time consuming! This has a great color, sounds wonderful! What an awesome idea for kool-aid! I’m not a fan of drinking it, but it would be awesome in a dessert! Yep … it was so good! Thanks for sharing this recipe; it looks delicious. Using the kool aid was quite a superb idea. 🙂 it was so good.